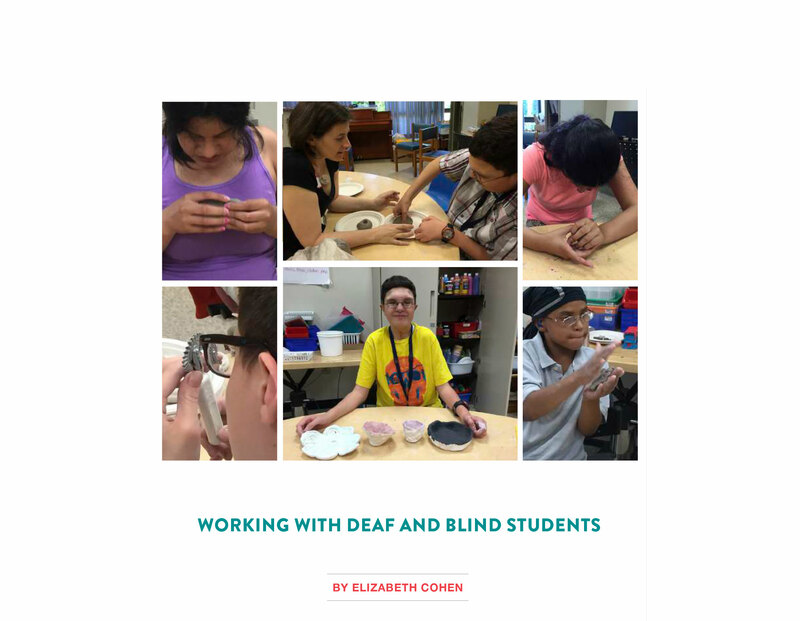 Students work with clay at the Perkins School for the Blind, Watertown, Massachusetts. Top, center: author Elizabeth Cohen (left) with a student. Since many of my students were completely deaf, the classroom was, for me, unusually quiet. I used the gift of silence to observe. Mille, a tactile-defensive deafblind nine-year-old, pulled away from the feel of clay but was willing to try using a hand-over-hand method to push a texturing tool into a small ball. 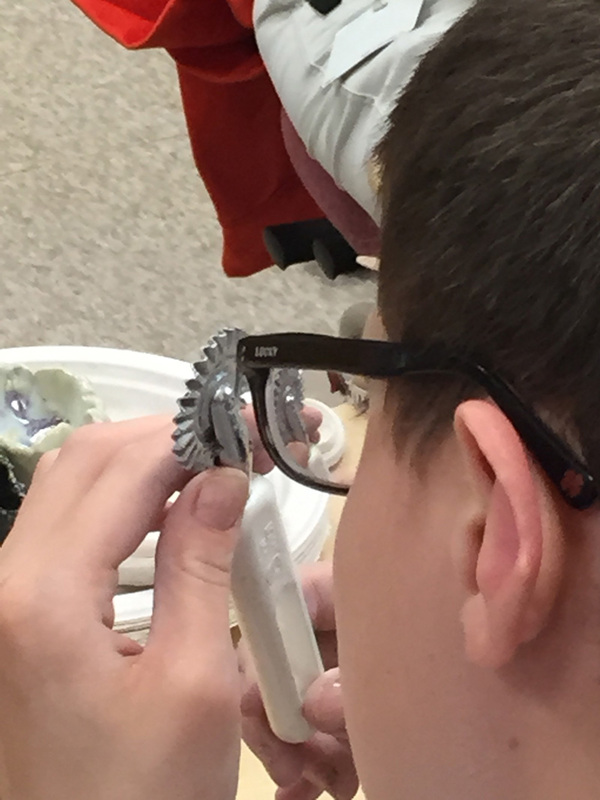 Some students preferred to interact with the clay via an “extension” of their hand, e.g., a tool, while others gravitated toward the immediacy of touching, pushing, smashing, rolling, and poking. Katie, age 13 and completely deafblind, grunted with pleasure when the teacher's aide put a ball of clay in her hands. She held it close to her body, rocking back and forth, intensely squeezing and “reading” with her hands for a solid twenty minutes. She asked for more clay and firmly resisted giving it up when the teacher signaled it was time to go. She stubbornly insisted that she take the clay with her. While she needed constant monitoring, because of her complicated medical conditions, the aide and I agreed to let her take it because the clay was nontoxic, talc free, and posed no other safety risk. Elizabeth is a Boston area independent studio potter creating wheel-thrown and altered functional and sculptural work in porcelain. Organic elements in nature, such as flowers, fruits, seeds, shells, and plants, inform her work. She explores varied metaphorical nuances, such as family, security, and comfort, in nesting sets. She holds a BA in English from Tufts University and a MAT from Simmons College. She can be reached at elizabeth@elizabethcohenpottery.